It’s a great time to start a startup. There are endless opportunities for game-changing innovation. Or even just simple solutions for day-to-day problems. And the costs of starting a tech-enabled business are lower than ever. But standing out from the crowd has never been tougher. Our lives are completely saturated with advertising. Your social media feed. Your inbox. Your search results. Your retail experience. Marketing is simply everywhere and getting more advanced by the day. 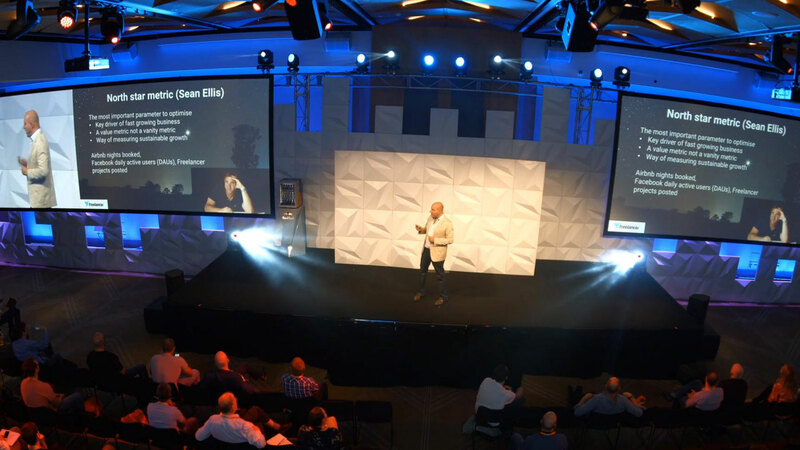 So with great enthusiasm, I headed to Startcon this year – Australia’s biggest startup conference. I wanted to learn how world-leading founders and growth experts are tackling this problem. How can startups succeed in 2018? Here’s a snapshot of the big ideas on how to grow. When was the last time you had a perfectly formed idea that didn’t get better by discussing it with others? Never, right? Consider that over the past 20 years, teams have won more Nobel prizes than individuals. Or how some of the most coveted jobs on the planet are in the growth team at the world’s most innovative companies. Success in the modern age relies on teams of people challenging the status quo and building on each other’s ideas. So if teams are critical, how can they best operate? It used to be that we optimised for efficiency. Think of the classic Bethlehem Steel case study of 4x improvement in shovelling output. That worked when jobs were predictable and people did the same thing every day. But we now live in an unpredictable world where our work is completely variable. We simply don’t do the same tasks every day. Great teams are fast-forming, they’re fluid and made up of resourceful, low-ego people. They make fast decisions rather than perfect ones. They use rapid learning cycles to inform regular course corrections. Data is fundamental then for rapid learning cycles. We collect ideas, prioritise them, pursue them and review the data to learn what works. Rinse and repeat. When you’re heavily resource constrained, as with most startups, you simply can’t pursue every random idea. You need to be disciplined and make sure your efforts focus towards a goal. On what basis should you prioritise effort then? This is where the ‘north star metric’ is vital. It’s the key metric that “captures the core value that your product delivers to customers”. For Airbnb, it’s Nights Booked. For Facebook, it’s Daily Active Users. Whatever it is for you, understand the variables that impact it and focus your effort on the ideas that will drive it up. There are plenty of successful companies out there selling clunky products. And many startups have achieved product-market fit, but simply can’t attract venture capital. And growth hacks… well they might give your metrics a bump, but not the step change you should be aiming for. Product-Channel Fit – products are built to take advantage of specific channels. You shouldn’t be building a product and then choosing the distribution channel afterwards. Channel-Model Fit – your channels are determined by your model and vice versa. By model, we’re talking about how you charge and what revenues you make on average from each customer. Model-market fit – because your market influences your model. Are you going after high customer volumes at low average revenues? Vice versa? Or somewhere in the middle? Most importantly, each of these ‘fits’ need to align. Simply put: Targeting the right market with the right product through the right channels at the right price. We see this play out in lots of ways. It’s building product for the sake of building. It’s focusing too much on what competitors are doing and not leveraging your own strengths. It’s tinkering with several channels rather than trying to crush it in one. Take heart in the fact there are multiple companies valued in the billions coexisting in the same space. Online education, HR management, ridesharing and payments are just a few examples. Sure they’re all chasing a large opportunity. But they intimately understand the customers they’re pursuing and have crafted a product to suit them. Sometimes it’s compelling experiences that keep people coming back. Or communities which use user-generated content to create loyalty. Or solutions which offer something people simply can’t get by without. Or immense value where customers receive 10x the benefit than what they spend. Ok, enough reading. It’s time to go out and change the world in 2018. I’d say focus and persistence are crucial for a startup. Once you know what your goal is, you can focus on it and create a plan of milestones to achieve it, and then of course you need to execute your plan with persistence. Nice article, for new tech startups this article is very helpful if they have set their goals and focusing on their targeted audience with a good marketing tactics startups can easily achieve growth. Thanks for this article is very informative.